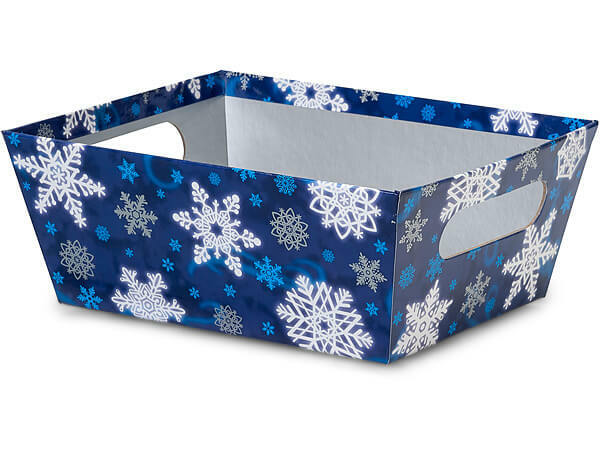 Large size Winter Wonderland Beveled Market Trays fby the 6-Pack feature white snowflakes on a blue background. These boxes have a wide base and measure 7-1/4" x 9-1/4" at the top, 5-1/2" x 7-1/2" at the bottom, and are 3-1/2" deep. Use with our C18BC Cello Bags, but you'll need to tape down the bottom corners of the cello underneath the tray for a beautiful presentation. For shrink wrapping, use 1216SB for a flat presentation that's even with the tray. Tall presentations use shrink wrap 2030SB. These Wide Base Market Trays are available in several popular designs. These versatile containers are made from heavy paperboard stock and work for gourmet gift baskets, food baskets or even as a home decor decorative accessory. Open top beveled containers have cut-out handles and are printed on all sides. We recommend a food safe barrier such as a clear cello sheet or cello bag as a bottom liner rather than packing these trays for direct food contact.